AFP Yosemite Chapter occasionally is informed of job openings that we can share on our website. Our Chapter includes members from Stanislaus, Merced and San Joaquin Counties. 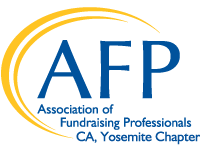 AFP Yosemite Chapter offers this service to AFP Members for a minimal charge of $25 for a 30-day listing. Non-members may purchase a 30-day listing for $50.